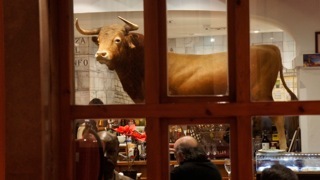 Just in case you had any doubt about what you ate, this restaurant in Sevilla made sure you knew with a life-size model of a bull on the bar. Any questions? The Grumpy Vegan’s first trip to Sevilla was a mixture of delight at such a beautiful historic town in the southern region of Andalusia in Spain and an assault on his delicate pro-animal sensibilities. 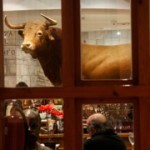 Fortunately, the timing of the visit (February) did not coincide with the bull fighting season. There were many other ways in which it was clearly demonstrated there was no question animals existed for human use. Nevertheless, there is a small but thriving vegan and organic community which was great to see. In addition, to life-size models of the animals people eat, many bars resembled butcher shops with racks of legs from dead animals hanging above the drinkers. Finding vegan food to eat in Sevilla was a challenge. Many menus had no vegetarian or vegan entrees and most of the salads contained meat, fish, dairy or sea food. You can't beat fresh vegetables cooked well. This mushroom and garlic tapas eaten in a lovely cafe in Sevilla was pure joy. 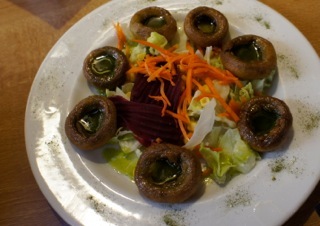 The Spanish cuisine and their tradition of ‘tapas’ eaten several times throughout the day offered opportunities to try delicious and simple vegetable-based dishes. In one delightful road-side cafe, a lazy lunch was enjoyed with one mushroom and garlic dish and another made from fresh spinach. 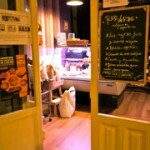 Gaia is a vegetarian/vegan, organic and slow food restaurant that is well worth a visit should you ever find yourself in Sevilla. We had an enjoyable dinner. So good, in fact, that all the Grumpy Vegan can remember about it was that it was great! 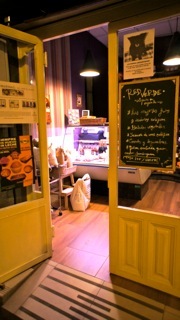 We also visit Red Verde, a small vegan shop, in what appeared to be a district of Sevilla where generations of people had lived. The traditions of life (church, school, work, etc.) were clearly self-evident. The streets were narrow and the buildings old. 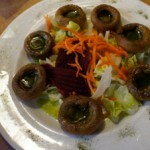 The vegan Red Verde in Sevilla.